Well, the end is nigh – so to speak – as we wave goodbye to a trusty stalwart of the last decade (and more) in the shape of Windows XP! It is with heavy hearts that some will say farewell, but things do have to move on and we are writing this column to let you know what it actually means for you; the typical home and small business user…. 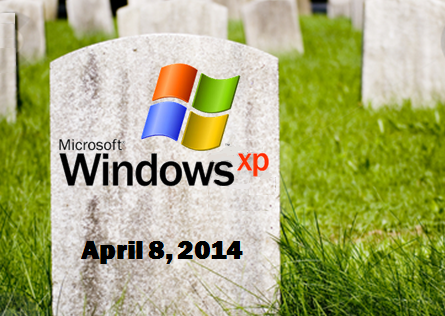 There is a lot of scaremongering going on about XP computers suddenly disappearing into oblivion as the clock chimes 12:00 on the 8th April, but the reality is far more mundane! Your Windows XP PC will continue to function on this end date much as it has over its life so far, but there are some very important considerations that we should all be aware of moving forward. When Microsoft support officially ends for an Operating System you can think of the associated security risks like the Council turning their backs on a stretch of road (no jokes please)! The road still exists, but over time it becomes full of holes that no-one (other than the odd hobbyist pot hole filler) fixes and it becomes increasingly more dangerous to use. Viruses will be created to exploit the security flaws which hackers find and this will eventually make XP a dangerous place to be! The other problem is that hardware and software manufacturers will stop taking XP into consideration, so new devices like printers, tablets and smart phones developed after April may no longer work with XP PCs. Also XP based Internet browsers will eventually stop working well (or at all) with websites, which will render it pretty useless for most of what the typical user does. In reality what this all means is that like it or lump it, we all need to proactively plan a migration from any XP machines as soon as feasibly possible. This can require free or paid software updates to your existing programs and ideally needs to be discussed with a professional; especially where business are concerned. If in doubt, give us a shout….